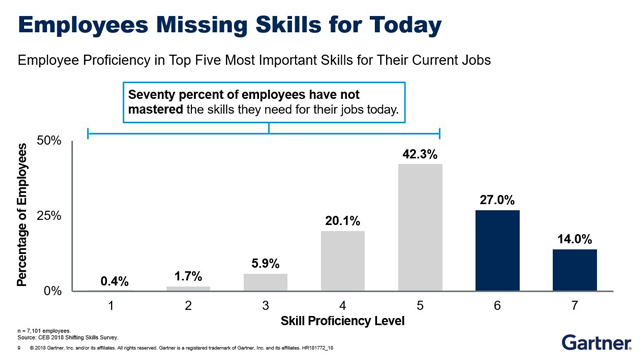 Source: Gartner CEB 2018 Shifting Skills Survey. In another take on the future of work, Gartner analysts told attendees at a recent event that just 30 percent of employees have the right skills for their current jobs, and only 20 percent have the right skills for both their current and future work. In research presented at the Gartner ReimagineHR conference in London, the company suggested that the skills gap is a result of the continuing digitalization being undertaken by organizations that want to remain competitive. Yet, addressing the gap comes with problems. On the one hand, most managers are dubious that their current workers can learn; and most workers themselves are ready to jump ship to go someplace where staff learning is valued. As Gartner reported, two-thirds of managers (64 percent) believe their employees are incapable of keeping pace with skills needs; and on the employee side, 28 percent of employees are "actively" seeking a job and 42 percent are "passively open" to new opportunities where they see future career development. "Attrition has always been costly for companies, but in many industries the cost of losing employees is rising, due to tight labor markets and the increasingly collaborative nature of jobs," noted Brian Kropp, Gartner HR practice group vice president. "If employees don't see you investing in their future with you, they're going to look somewhere else." Bringing the workforce up to speed, said Vice President Sari Wilde, requires "considering the skills that the market is calling for, and showing employees the personal benefit of acquiring these new skills." Accelerating new skills development not through self-service, but with "quality development experiences." These might include boot camps, competitions and hackathons and opportunities to work on new experiences within the company. According to Gartner research, an emphasis on building connected learners can increase employee skills preparedness by 28 percent to 39 percent over more traditional "continuous learning." Additionally, employees who are connected learners are eight times more likely to be identified as high performers within the organization.